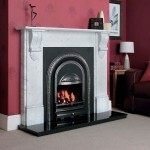 Smooth, elegant and simple – an arch style cast iron fireplace is refined style at it’s best. While it may seem like something only the biggest of households can accommodate, this isn’t actually true. In fact, our Coronet model has been specifically made to fit into smaller rooms. 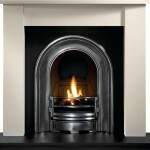 It speaks to York Fireplaces commitment to choice – if you desire a certain type of fireplace, we want to provide you with the ideal one, regardless of the restriction you have. So just as we accommodate for those with smaller houses, our Ashbourne model is a grand affair, ideal for those looking for a big eye catching centre piece for their living room (or any room for that matter). So feel free to check out the ornate Ashbourne, or the smooth Coronet, down below or in our Birmingham showroom.